Whitewater Canoe Rental offers scenic canoe trips, kayaking, tubing, rafting, and riverside camping on the Whitewater River in southeastern Indiana for individuals, families, and groups of any size. Whitewater Canoe Rental has locations on the Whitewater River on US Hwy 52 in Brookville, Metamora, and New Trenton, Indiana. We are located only 30 minutes from Cincinnati, and 60 minutes from Indianapolis. 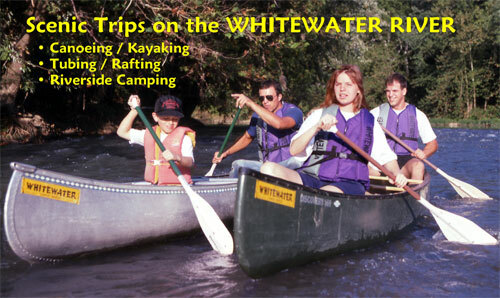 Whitewater Canoe Rental generally operates early May through September, river level and weather conditions permitting. Please call in advance (765-647-5434) for April and October trip schedules. (our business office can be contacted year-round for information, reservations, sales, etc.) Regardless of your needs, our staff will gladly assist you with planning for group trips, camping, group picnics, etc. The cost for our all-day canoe trip, about 6-8 hours, is $23.50/adult paddler plus tax, based on 2 paddlers/canoe. Our half-day canoe trip, about 4 hours, is $21.50/adult paddler plus tax based on 2 paddlers/canoe. After 2:00 p.m., we offer a 2-1/2 hour float trip, when river conditions permit, for $20/adult paddler plus tax. There's no charge for third riders in canoes. Kayak rentals, starting before noon, are $25.25/kayak plus tax for adults for our all-day trip, about 6-8 and 8 hours. Our half-day kayak trip, starting in the afternoon, is $23.50/kayak for adults plus tax. Tube rentals for trips starting in the morning, about 5-6 or 7 hours, are $20/tube/adult plus tax. Afternoon tube trips, about 4 hours, are $15/tube/adult plus tax. Cooler tubes are $5/tube; one complimentary cooler tube is issued with each 6 tube rentals. Teenagers (under 18 years of age) renting tubes along with adults are $15/tube plus tax for our morning tube trip and $12/tube plus tax for afternoon tube rentals. Children 12 and under are charged $10/tube plus tax for any of our one-day tube trips when renting with adults. Rafting fees vary with the number of people in the raft, the distance of the trip, the day of the week, and the time of day starting the trip. Rafts are available in 4 sizes that can carry from 2 to 8 adults. Costs will vary from $15 to $30/adult plus tax. Group rates for all types of rentals will be confirmed with email reservations and email confirmation in advance of trip date. Private canoes, kayaks and tubes are charged $12/boat to use the private section of the river. The rate includes transportation for the paddlers. Anyone with private watercraft must reserve a few days in advance for weekends and holidays.